The adapter “WCF-Custom” raised an error message. Details “System.ServiceModel.CommunicationException: Unrecognized message version. The adapter “WCF-Custom” raised an error message. Details “System.FormatException: Input string was not in a correct format. 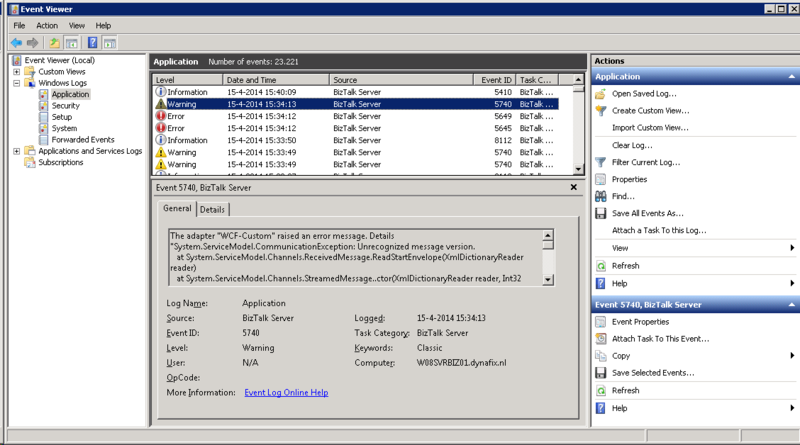 After some research, I found out this is due to the way the messages are being deserialized by the BizTalk WCF adapter. To solve this, when placing the messages on Service Bus, we have to publish them as WCF messages, instead of using the Service Bus SDK. For our current customer, we have both WCF and SOAP webservices we want to expose, however IIS does not allow these 2 different types to live under the same website. Therefore, I would have to create one of the webservices in a non-default website. I wanted to use the BizTalk Deployment Framework for this, to make deployment easy, and to make sure the webservices would always be deployed to the correct website. Here you only have to change the 2 to the ID of the website under which you want the webservice to run, which can be found by opening the advanced properties of the website in IIS Manager. 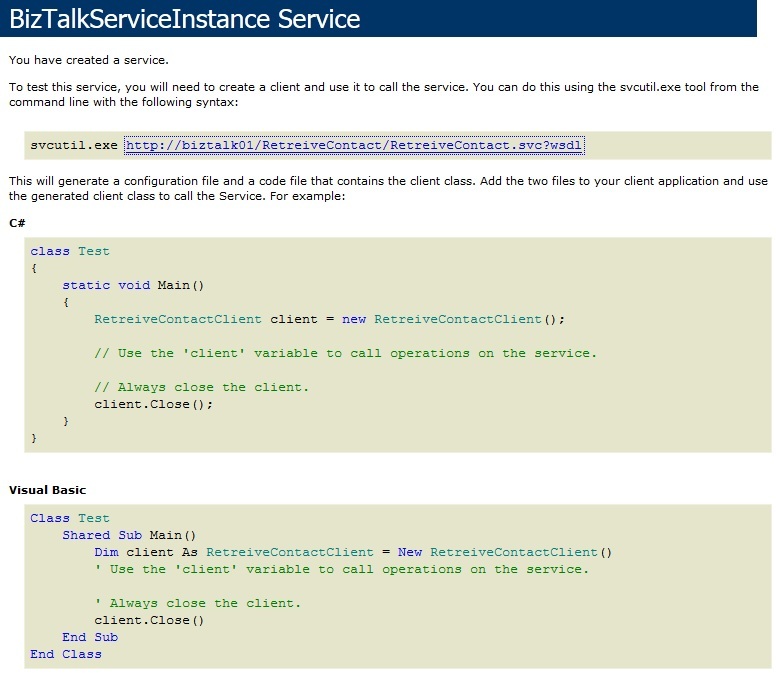 After the virtual directories have been created IIS has to be restarted. Luckily, this can also be done using BTDF, by setting the SkipIISReset property. Next you will have to specify the settings of the webservice. For this create a new ItemGroup, which should be placed under the PropertyGroup with the ProductID. You will also have to specify the user credentials the AppPool will run under. I used the SettingsFileGenerator.xml file for this. Add VDIR_UserName and VDIR_UserPass to this document, and set them for your environments. Now go back to the BTDF project file, and add the following under the ItemGroup you just created. Standard, the AppPool will be running .NET2, however we want it running .NET4. In the final release of BTDF v5 there will be a new attribute on the VDirList for this, but for now we have to use a CustomPostDeployTarget. Now when you use the BTDF to deploy your application, it will automatically set up an AppPool and create the WCF webservice for you. Today we ran into a small problem while exposing a schema as a WCF service. We could open the service in our browser, we would see the service. 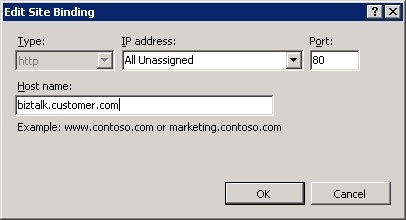 The document at the url http://biztalk.customer.com/RetreiveContact/RetreiveContact.svc was not recognized as a known document type. – Report from ‘XML Schema’ is ‘The document format is not recognized (the content type is ‘text/html; charset=UTF-8′).’. – Report from ‘http://biztalk.customer.com/RetreiveContact/RetreiveContact.svc’ is ‘The document format is not recognized (the content type is ‘text/html; charset=UTF-8′).’. – Report from ‘DISCO Document’ is ‘There was an error dowcomoading ‘http://biztalk01/RetreiveContact/RetreiveContact.svc?disco’.’. – Report from ‘WSDL Document’ is ‘The document format is not recognized (the content type is ‘text/html; charset=UTF-8′).’. Metadata contains a reference that cannot be resolved: ‘http://biztalk.customer.com/RetreiveContact/RetreiveContact.svc’. Now the trick is in this part: – The remote name could not be resolved: ‘biztalk01’. We are contacting the machine from the outside, but our service points to an internal server. To change this, I went into the IIS manager, opened Sites -> BizTalk Site, and opened the bindings. Here I edit the http binding, and changed the hostname to biztalk.customer.com, and after restarting the website we could now succesfully import the service in Visual Studio.